Welcome to this year's 27th issue of DistroWatch Weekly! Linux comes in all shapes and sizes. Linux may very well power your laptop or your smart phone, your server or maybe even your car. This week we talk about Linux and other open source operating systems, covering a variety of ways these projects can be used. We begin with a review of LXLE, a lightweight operating system which tries to combine user friendliness, power and small resource requirements. In our Questions and Answers column this week we discuss security for Linux users at home, sharing some practical steps for staying secure. In our News section we talk about a desktop environment designed with an unusual audience in mind, OpenBSD users. We also discuss plans to make the artwork in openSUSE more consistent and beautiful. Plus we discuss Linux-based software being used in automobiles, might Linux be coming to your car? We also talk about the distributions released over the past week and look ahead to fun new developments to come. We wish you all a fantastic week and happy reading! What is LXLE? From the project's website: "LXLE is based on Lubuntu which is an Ubuntu OS using the LXDE desktop environment. It is designed to be a drop-in and go OS, primarily for ageing computers. Its intention is to be able to install it on any computer and be relatively done after install. At times removing unwanted programs or features is easier than configuring for a day. Our distro follows the same LTS schedule as Ubuntu. In short, LXLE is an eclectic re-spin of Lubuntu with its own user support." The latest release of LXLE supports one architecture, 64-bit x86, though people who wish to run a 32-bit build of LXLE can do so by downloading the older LXLE 12.04.4 long term support release. Looking at the download options it appears that LXLE is available only as a torrent download (of 1.4 GB) or potential users can purchase a physical disc containing LXLE. Right off the bat one thing I appreciated about the LXLE project was that the distribution's website was written is clear language. Many small projects have either vague or overly technical descriptions of their distribution and it is nice to see LXLE explains things carefully and in a way non-technical users can understand. I especially like that the list of changes for this release includes reasons for the changes. The developers did not just swap out one application for another, they said why the choices were made. Some of the key features of the 14.04 release include multiple desktop styles, including themes for migrating Windows XP and OS X users. There are also themes which mimic GNOME 2/MATE, Unity and mobile devices. The new LXLE release features the BitTorrent Sync client (which replaces Ubuntu One), multimedia support out of the box and the LXDE desktop environment, making the distribution suitable for lower-end computers. Booting from the LXLE media brings up a menu where we can opt to explore LXLE's live desktop environment or launch the project's system installer. Jumping into the installer we find that it is effectively the same installer Ubuntu and Lubuntu provide. We are asked to select our language from a list and we have the option of viewing the project's release notes. We are then asked if we would like to install third-party multimedia support and/or download software updates during the installation. Next we come to the disk partitioning section of the installer. We can take a guided option which can be given parameters such as encrypting our data or setting up LVM volumes. We can also take a manual partitioning option. I found the installer's manual partitioning screen to be easy to navigate and nicely streamlined. Next, the installer asks us to confirm our time zone using a map of the world and we then select our keyboard's layout from a list. The last screen of the installer gets us to create a user account and provide a password for this account. We have the chance, at this point, to encrypt our user's data. After that the installer finishes copying its files to our hard drive and we are asked to reboot the computer. The locally installed copy of LXLE boots to a graphical login screen. From this screen we can select which style of desktop we wish to use with options including XP, GNOME 2, Unity, OS X and Netbook. I played around which each of these options and found they caused key elements of the desktop, such as the application menu and task switcher, to change position, but the style of icons and the behaviour of buttons and other interface elements did not change. When we login there is a system monitor in the upper-right corner of the display. Hidden over on the left side of the screen is a quick-launch panel which will appear when our mouse pointer gets near the edge of the display. 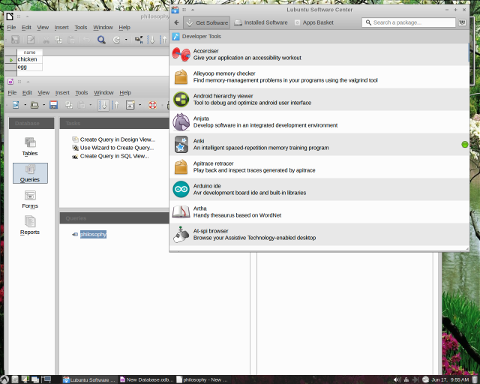 The application menu is typically located in the upper-left or lower-left corner of the screen. A few minutes after I logged in I noticed the interface had been staying quiet and out of the way. There had been no welcome screen, no pop-ups and no notification of software updates. I went looking for a software updating application and found an item in the application menu called Software Updater. This entry launched a small package upgrade application which showed me a summary of available updates. I agreed to download and install the 103MB of waiting software upgrades. These items were all fetched and installed on my system without any problems. Also on the topic of software management, LXLE ships with two graphical package managers. The first is a modern package manager called Lubuntu Software Centre which lets us browse categories of software using big, colourful icons. Clicking on an application name brings up a detailed information screen which shows us a description of the software and a screen shot. Items can be installed or removed by clicking a button. I found it was interesting that asking the package manager to install an item would cause the package to be queued for processing later. However, when I opted to remove an application this would cause the unwanted program to be removed immediately. Removing a package would also cause all queued installations to be processed right away. I ran into one problem where, if I removed a program and then located the removed item in the list of available items, the software manager would not allow me to re-installed the program. The software manager offered me a "Remove" button for these already removed items. I found that closing the software manager and then opening it again would refresh the package database and I could then re-install the removed program. The second graphical package manager is Synaptic. The Synaptic package manager displays available and installed software in a list and processes actions in batches. Synaptic features a sparser interface and focuses on specific packages where the first software manager, Lubuntu Software Centre, focuses on end-user desktop applications rather than underlying packages. I ran LXLE in two environments, a physical desktop machine and in a VirtualBox virtual machine. In both cases I found the distribution ran smoothly and quickly. LXLE properly configured my network connection, sound worked out of the box and my screen was set to its maximum resolution. The LXDE interface was pleasantly responsive. I found the distribution used approximately 190MB of memory, which seemed unusually high for an operating system running the LXDE desktop. A quick check showed that LXLE ships with the preload service running. The preload service loads commonly accessed programs into memory to make opening them faster. This leads to more RAM being used while some frequently accessed programs are loaded more quickly. The LXLE distribution ships with a wide range of applications and there are desktop programs suited to most tasks. We are given the Firefox web browser and Flash plugin, the Claws e-mail client and the Filezilla file transfer application. BitTorrent Sync is provided to help us synchronize files between multiple computers. The distribution provides the Linphone software phone, the Pidgin messaging client, the XChat IRC client and the Transmission BitTorrent client. We are given the uGet download manager, the FBReader e-book reader, the LibreOffice productivity suite and a PDF document viewer. The Osmo personal organizer is included for us along with the Mirage image viewer, the Shotwell photo manager and the GNU Image Manipulation Program. LXLE comes with a large assortment of games, the Marble virtual globe and the Xfburn optical disc burner. The distribution ships with several multimedia applications, including the Totem video player, the Guayadeque music player, the OpenShot video editor and the Minitube YouTube client. The Audacity audio editor is available for us too. We find a text editor, virtual calculator, file archive manager and backup utility in the application menu. There are some administrative tools, including a users & groups manager and an app for configuring printers. There is an application for downloading and enabling third-party device drivers and the Clam anti-virus software. LXLE comes with a few accessibility programs such as a virtual keyboard and a screen magnifying tool. I found both of these accessibility utilities worked, but the visual output from both programs was not reliable. For example, sometimes the keys on the virtual keyboard would not show up. I could still blindly click on the keys, but they were not visible. Likewise, sometimes the zoom tool would blank-out when I moved the magnifier around, forcing me to close and re-launch the accessibility app. The distribution ships with Network Manager to help us get on-line, the GNU Compiler Collection for developers and Java. 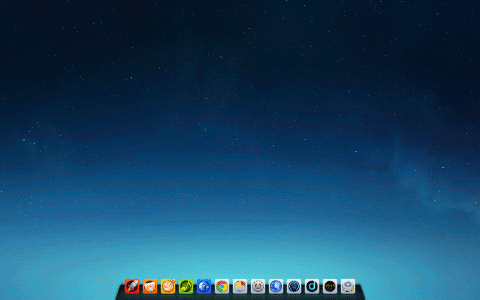 There are also lots of small apps for adjusting the look and feel of the LXDE desktop interface. In the background we find the Linux kernel, version 3.13. Generally speaking, I enjoyed my time with LXLE. The distribution got off to a good start with a smooth installation process and the project features clear documentation and release notes, letting people know exactly what to expect from the distribution. 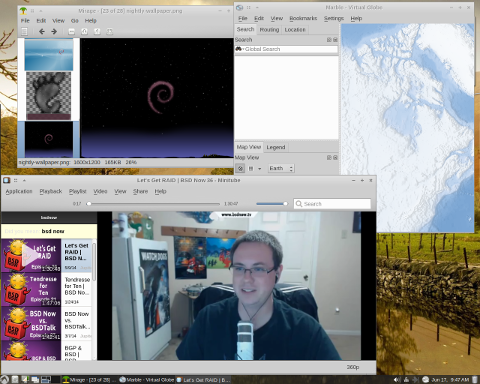 I like the LXDE desktop as I feel it does an excellent job of balancing user friendliness, performance and features. The LXLE feature which allows us to change the look of our desktop session is a nice bonus and may make it easier for Linux newcomers to navigate the LXDE interface. The distribution ships with a lot of great desktop applications, almost all of them worked well for me. I feel that most people will be able to sit down and just start using this distribution without worrying about configuring software or downloading additional applications. The interface was responsive, the distribution doesn't use a lot of memory (even with preload enabled) and all of my hardware was handled properly. There were two things I felt were missing from LXLE. The first was any notification of software updates. This distribution appears to be targeting novice Linux users and I think having a subtle icon in the system tray that lets us know when updates are available would be a nice feature. I appreciate the developers setting up an interface without distractions, but I feel this should be balanced against the importance of letting users know when security updates are available. The second feature I had expected to see (and did not) was the WINE Windows compatibility software. LXLE is likely to appeal to a wide audience and, I suspect, people migrating from Windows XP will make up a large portion of the LXLE userbase. With that in mind, I feel having WINE included would be a suitable default. Still, WINE can be found in the project's software repositories and LXLE ships with enough functionality to appease most users. All in all, I was happy with what LXLE has to offer. The distribution does a really good job of supplying a lot of functionality with a small resource footprint. The desktop environment is fairly lightweight, can be tailored to look familiar to a variety of users and is responsive. I found the system to be stable and easy to navigate. There were a few minor issues during my trial, but certainly no major problems. I think LXLE is a fine distribution for both ageing computers and new Linux users. The OpenBSD operating system is well known for being secure, for having a clean design and for its accurate documentation. What OpenBSD is not typically known for is its role as a desktop operating system. The SimpleDE project may change that. 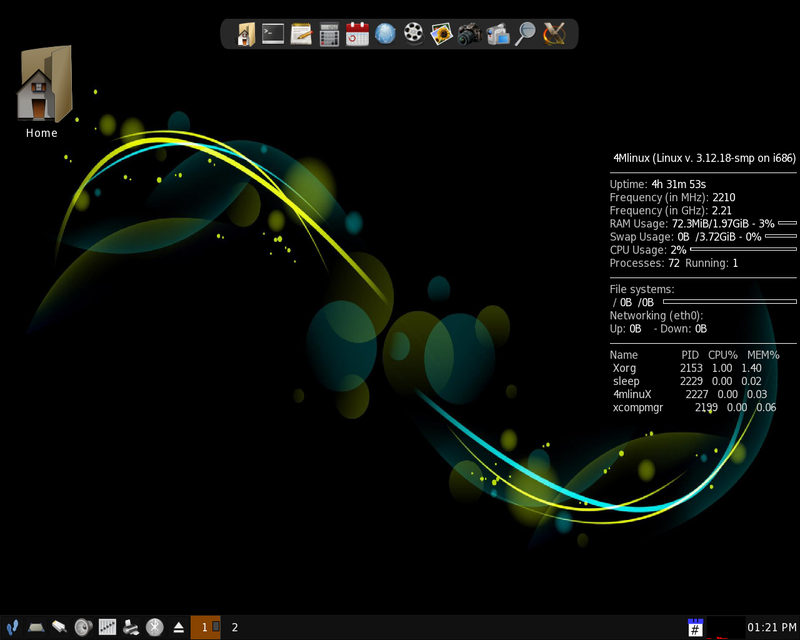 SimpleDE is a desktop environment designed for the BSDs, particularly OpenBSD. SimpleDE tries not to tie itself to any particular platform and features detailed notes on getting the desktop environment installed on OpenBSD systems. The latest release of SimpleDE for OpenBSD 5.5 along with its release notes can be found on the Daemon Forums. One of the more important aspects of designing a desktop environment is consistency. The openSUSE project, known for its green palette and gecko mascot, is looking to update its artwork and design guidelines, making for a more consistent look across supported desktop environments. "Two of SUSE’s professional designers, and also members of the openSUSE community (of course) Kenneth Wimer and Zvezdana Marjanović, have decided to create new artwork and branding guidelines to freshen up, modernize and uniform the openSUSE brand, making it good looking, unique and homogeneous across the whole product spectrum." Many of us use Linux on our desktop computers, on our servers and on our smart phones, so why not use Linux to run your car? The Linux Foundation posted an update last week about running a Linux-based software stack for automobiles. From the report on Automotive Grade Linux (AGL) states: "AGL is building the industry's only fully open automotive platform, allowing automakers to leverage a growing software stack based on Linux while retaining the ability to create their own branded user experience. Standardizing on a single platform means the industry can rapidly innovate where it counts to create a safe and reliable connected car experience." More details on the AGL project can be found on the Linux Foundation's website. Back in 2006 this website published an April Fools article that jokingly hinted at a possibility of Linux users being looked at as extremists and even terrorists by the authorities in certain countries. Little did we know that in 2014 this proposition does indeed become a fact of life, at least in the minds of security personnel of a certain security organisation. As the Linux Journal magazine revealed last week, those of us who use the privacy-preserving Tails distribution and who read the Linux Journal magazine, are now labelled as "extremists" by USA's National Security Agency (NSA) and placed under increased surveillance: "While it has been revealed before that the NSA captures just about all Internet traffic for a short time, the Tagesschau story provides new details about how the NSA's XKEYSCORE program decides which traffic to keep indefinitely. XKEYSCORE uses specific selectors to flag traffic, and the article reveals that web searches for Tor and Tails - software I've covered here in Linux Journal that helps to protect a user's anonymity and privacy on the Internet - are among the selectors that will flag you as 'extremist' and targeted for further surveillance." Locking-the-front-door asks: I am a home user and pretty new to Linux. What are some basic security tips for those of us running Linux on a laptop at home who don't need fancy (complicated) security? DistroWatch answers: The first thing I would suggest you do is turn off any network services running on your home computer. Many distributions ship with network services enabled and these services can act as a doorway for remote attacks. Distributions often enable, by default, the OpenSSH secure shell server, an e-mail server, Samba network shares or the CUPS printing software. Disabling these services (assuming you don't need them) is a good way to reduce the number of ways an attacker could access your computer. If you aren't sure how to disable network services, please ask on your distribution's support forum. The above example lets us know there are two network services running on our computer and these should probably be disabled. Another good idea is to keep up with your distribution's security updates. A modern operating system is a complex and large collection of software. People are constantly finding problems with existing software and issuing fixes to correct these problems. Most distributions release software updates every week. I recommend setting a reminder for yourself to check for updates every day at a certain time (or at least once a week). Checking for software updates just takes a minute out of your day and can correct a lot of problems before the bad guys come knocking. Some distributions will automatically let you know when security updates are available and will even download updates for you, so check the settings of your distribution's package manager to see if you can automate the process. Another thing you can do, which relates to security updates, is to make sure you are using a distribution which is still supported. Some distributions have short life cycles and might no longer receive support without warning. Check with your distribution's website to find out if the version of your operating system is still being supported. Try to avoid downloading software that is not part of a trusted software repository. Linux distributions supply most of the software you are likely to need in their software repositories. Steps are typically taken to make sure the applications in these repositories do what they claim to do and nothing else. This means installing applications through your distribution's package manager is usually safe. Where a lot of malware comes from is third-party websites, or websites which imitate trusted third-party vendors. Try to avoid downloading software from websites and stick with the software your distribution provides. Likewise, avoid running packages e-mailed to you or opening attachments from people if you were not expecting them to send you something. Every day my inbox receives as least one e-mail with a malicious attachment, ignoring them is a good way to protect your computer and your identity. Most modern web browsers support extensions which make you safer on-line. Install extensions such as NoScript in your browser. This allows you to filter out scripts from all but the websites you trust. Installing extensions like HTTPS Everywhere is also a good way to protect your login credentials when you visit websites and forums. To sum up, try to avoid running software and services you don't need. Make sure the software you do run is up to date and supported. Don't open or install files from unknown or untrusted sources, stick to official software repositories. And, finally, install security extensions in your web browser. These steps won't make you immune to security threats, but they will protect against many common attacks. A bug-fix release of antiX 14 "MX" edition, a variant of antiX developed in collaboration with the MEPIS Community and featuring the Xfce desktop, has been released: "MX-14.2 'Symbiosis' bug-fix upgrade release available. Upgraded bug-fix versions (PAE and non-PAE) of MX-14 are now available. This version has fixed some bugs found in MX-14.1.1 and Debian upstream. LibreOffice updated to the 4.2.5 version; Google search engine bug fixed; toned down faulty hard drive error when installing; image files open with mirage; wl modules for Broadcom wireless now on the CD image; updated documentation." Visit the project's home page to read the brief release announcement. José Antonio Calvo has announced the release of Zentyal 3.5, a major new version of the project's server distribution - now based on Ubuntu 14.04: "The Zentyal development team is proud to announce the release of Zentyal 3.5, a new Zentyal Server Community edition. Zentyal Server is the open-source alternative to Windows Small Business Server, including native replacements to Microsoft Active Directory and Microsoft Exchange Server. Among all the changes Zentyal 3.5 introduces, we would like to put the focus on: new base distribution: Ubuntu 14.04 LTS 'Trusty'; removal of synchronization with OpenLDAP; support for Microsoft Outlook 2010 and inbox refresh improved; removal of some modules (L7 Filter, FTP, Zarafa, User Corner, Captive Portal and Bandwidth Monitor) to focus on the rest." Read the release announcement for upgrade instructions and see the detailed changelog for a long list of improvements. Steven Shiau has released a new stable version of Clonezilla Live, a Debian-based specialist live CD for disk imaging and cloning tasks: "This release of Clonezilla live (2.2.3-25) includes major enhancements and bug fixes. Enhancements and changes: the underlying GNU/Linux operating system has been upgraded, this release is based on the Debian 'Sid' repository as of 2014-07-01; Linux kernel has been updated to 3.14.7; the drbl package has been updated to 2.9.9 and Clonezilla has been updated to 3.10.26; syslinux has been updated to 6.03-pre17; the makeboot.sh script has been patched to support XFS, UFS and FFS; the ca_ES, de_DE, es_ES, fr_FR, it_IT, ja_JP.UTF-8 and sk_SK language files have been updated; a testing program 'ocs-img-2-vdk' has been added, it can be used to convert Clonezilla image as virtual disk file (qcow2 and vmdk) via KVM...." Read the release announcement for a full list of changes and enhancements. Alexander Tratsevskiy has announced the release of Calculate Linux 13.19, an updated version of the Gentoo-based distribution with separate flavours for desktops (with KDE or Xfce), servers and media centres: "We are happy to announce that Calculate Linux 13.19, the last of the 13th, has been released. CL 14 is coming soon after, with many new features, such as totally rewritten assemble & compilation utilities, GUI and command-line updater, automatic update check, new approach to profiles. Major changes: software update: Linux kernel 3.14.9, KDE 4.13.2, LibreOffice 4.2.5, Chromium 35; a configuration tool for Shorewall has been added to CLD, CLDX, CDS and CMC; exFAT is now supported in CLD, CLDX and CMC; CLD and CLDX have PulseAudio support...." Read the rest of the release announcement for a full list of changes. TheeMahn has announced the release of Ultimate Edition 4.2, an Ubuntu-based distribution featuring the MATE 1.8 desktop environment: "Ultimate Edition 4.2 was built from the ground up debootstrapped from the Ubuntu 14.04 'Trusty Thar' tree using Tmosb (TheeMahn's Operating System Builder) which is also included in this release. This release is a long-term support (LTS) release, supported until the year 2019. This release is most certainly worthy of the Ultimate Edition title. What makes this operating system different then any other operating system on the entire planet? The entire Mate 1.8 repository was first repo-stormed by a world-changing application I am developing. I have told the world it was coming. I have included many, many tools I am constructing that reside under the hood of virtually all Ultimate Edition releases." Read the rest of the release announcement for further details. Chen Xiang Bang has announced the release of Deepin 2014, a new stable version of the Ubuntu-based community distribution with a custom desktop environment that bears the same name: "Deepin 2014 release - hold your dream and move forward. Deepin is a Linux distribution that aims to provide an elegant, user-friendly, safe and stable operating system for global users. Based on HTML5 technologies, Deepin team has developed a series of new special software applications, such as Deepin Desktop Environment, Deepin Music Player, DPlayer and Deepin Software Center. 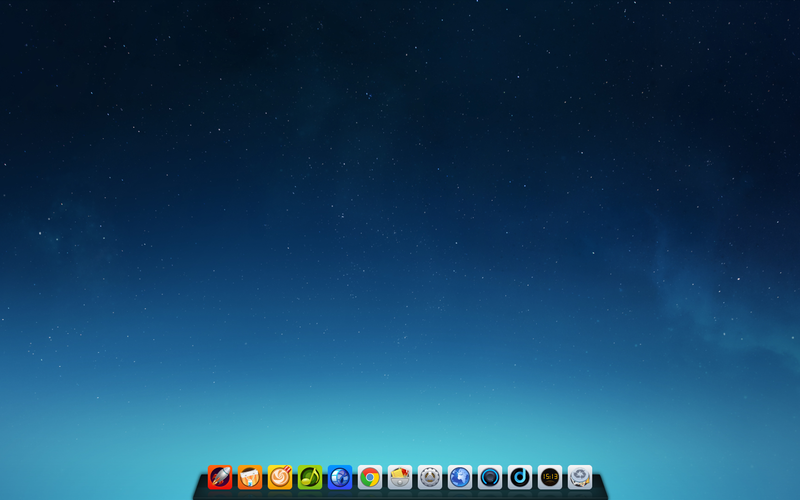 Deepin 2014 brings a brand-new Deepin Desktop Environment 2.0, with a specially designed Deepin theme, which makes the overall style and appearance of Deepin 2014 unified, neat and tidy. It also adds convenient features, such as user guide, starter Chinese phonetic search and intuitive hot zone settings." See the release announcement for a full list of improvements and plenty of screenshots. 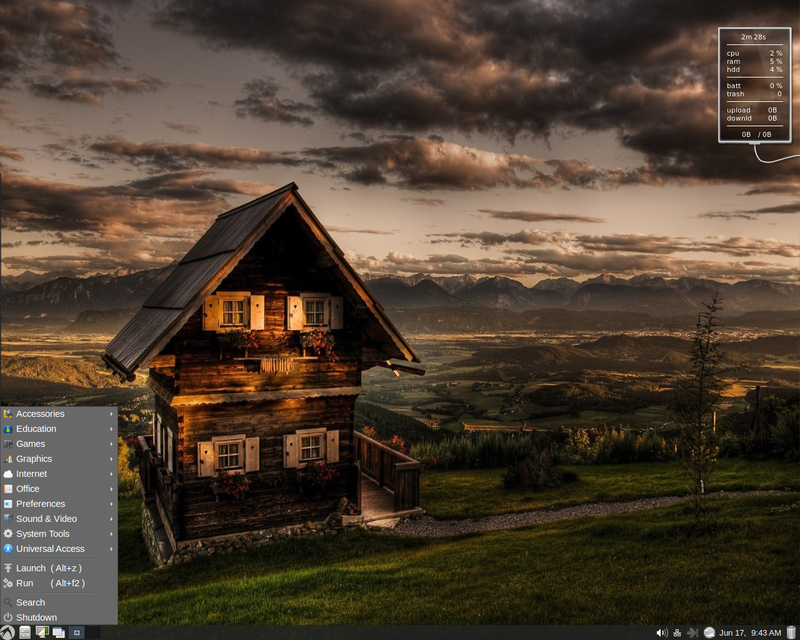 Zbigniew Konojacki has announced the release of 4MLinux 9.0, a minimalist and lightweight desktop Linux distribution with JWM as the preferred window manager: "The status of the 4MLinux 9.0 series has been changed to stable. The final release has all the features included in 4MLinux 9.0 Rescue edition, 4MLinux 9.0 Media edition, 4MLinux 9.0 Server edition, and 4MLinux 9.0 Game edition. I do not use code names in 4MLinux, but if I did this would be 'nerdy' for the 9.0 series. You can install development packages just in one click. Some of the packages (e.g. full versions of Python and Perl) can be used by both programmers and webmasters. An option to download and install the vanilla version of Clang with LLVM has also been added." Visit the project's news page on Blogspot to read the brief release announcement and to see a screenshot of the desktop. As many of you noticed, the distrowatch.com domain name was suspended by the domain's registrar, Doteasy, last Sunday. I don't want to go into details about what exactly happened as it's a long and boring story. Suffice to say that I feel grossly aggrieved by the series of greedy and even malicious actions taken by Doteasy and as soon as I get this sorted out, I will be looking into transferring the distrowatch.com domain name to another registrar. If any of you have a recommendation for a good registrar (preferably with customer support personnel that is competent), please let me know in the comments section below or send me an email. We are pleased to announce that the recipient of the June 2014 DistroWatch.com donation is SME Server, a specialist CentOS-based Linux distribution for servers. The project receives US$350.00 in cash. Those of you who were frequenting this website in its early days might remember the name e-smith (here is a review of e-smith by Linux Journal from 2001), a well-regarded distribution for which we received much praise at the time. It was a commercial offering, but the company behind it did not last and eventually it was the community of users and developers at contribs.org who took it under their wings, renaming the distro in the process. Wikipedia's SME Server page describes the product as follows: "SME Server (formerly known as e-smith) is a Linux distribution based on CentOS offering an operating system for computers used as web, file, email and database servers. It employs a comprehensive UI for all management-related tasks and is extensible through templates. The letters SME stand for Small to Medium Enterprise, as that is the target market of the software. One of the most notable features of this distribution is its template system." See also the project's About page for a description of the product's main features. Since the launch of the Donations Program in March 2004, DistroWatch has donated a total of US$40,125 to various open-source software projects. HandyLinux. 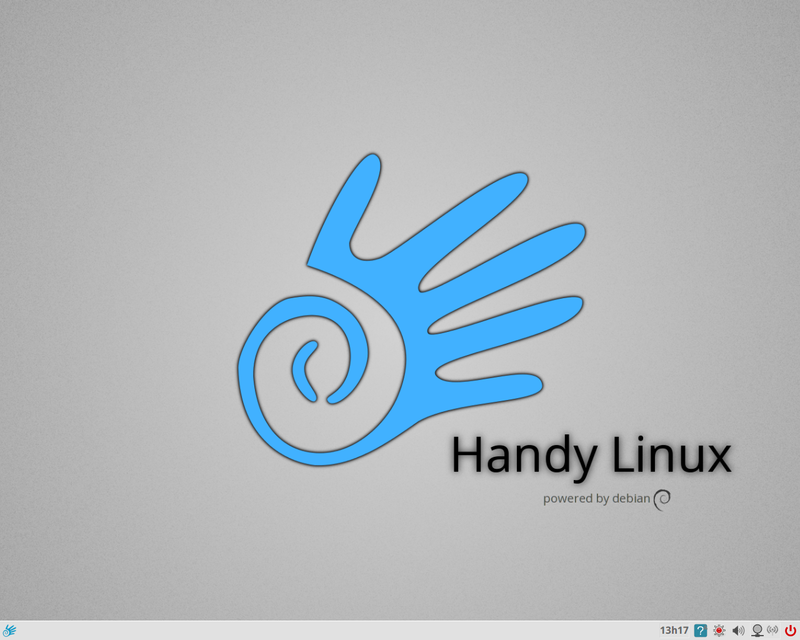 HandyLinux is a French distribution designed for novice Linux users. 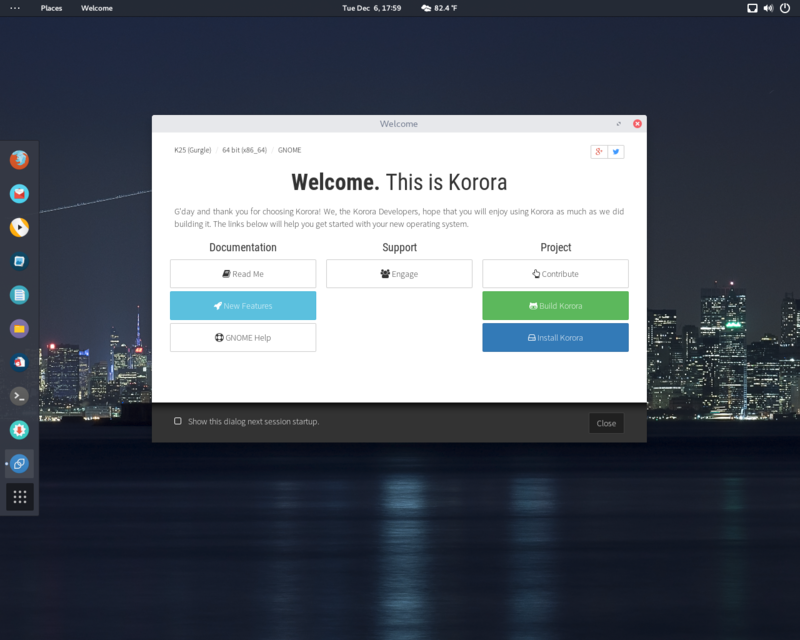 It is based on the latest stable version of Debian GNU/Linux and it uses the Xfce desktop environment. The main feature of the distribution is a custom start menu with applications and Internet bookmarks grouped in tabs. HandyLinux integrates the latest versions of the Chromium web browser, LibreOffice office suite, Skype conferencing and messaging client, VLC video player and other popular applications with the stable Debian base. Ubuntu MATE Remix. Ubuntu MATE Remix is an Ubuntu-based operating system which features the MATE desktop environment.